Kawneer provides a range of door solutions for a residential and commercial property. All Kawneer doors are designed with performance, high security, thermal efficiency and reliability. The Kawneer Entrance Door for residential and commercial applications. Kawneer has four distinct categories for their many different entrance doors, depending on where they are being used. From a balcony door in a dwelling to a door set subjected to frequent and even violent usage, Kawneer entrance doors provide a range of options and solutions. Kawneer categorises its range of entrance doors into four definitive categories helping end users, architects and contractors choose the right type or door with the correct level of performance. The categorisation of Kawneer doors also meets specifications set out by The British Standards Institution. A light duty door is one that will be subjected to low use and little misuse such as an occasional exit door or balcony door. Doors fitted in dwellings, buildings with low occupancy or where people are familiar with the door type and method of operation can fall into this category. Light duty doors are intended for residential applications. Medium duty doors are suitable for buildings were use is of a modest nature. These can primarily be residential main entrance doors, low usage commercial traffic doors and doors to communal but not public areas. The user of a medium duty entrance door is still likely to exercise care in how it is used with only a small chance of misuse. Heavy duty entrance doors are classified as doors with high use by individuals familiar with their operation and wider members of the public. Typically these will be commercial quality entrance doors designed for high traffic flow. 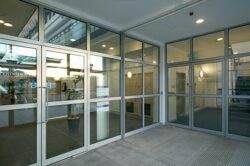 Examples are primary entrance doors to retail parks, shops, offices, schools or hospitals. A severe duty entrance door is one where scores of people use the door set and with a high chance of frequent, irregular or even violent usage. This type of door will feature a reinforced welded construction, thicker sections and robust door hardware. A severe duty entrance door can be a door to a storeroom that can have trolleys, or other devices pushed against them instead of a manual operation. Other examples are doors in schools, stadiums, theatres, public walkways and other high traffic areas where there is no guarantee of how a door is likely to be opened and closed. The range of Kawneer doors includes thermally broken and solid variants, doors with a welded construction and doors accepting a vast variety of locks, access control systems, residential hardware or automatic operation. If you would like further information and guidance on specifying the right type of entrance door for a commercial or residential building, please contact us.